As I discussed in an earlier product review of mine TaoTronics seem to have understood that wireless is the way forward. Now they upped the ante by creating a water resistant Bluetooth speaker. This device looks and feels great. The speaker has a soft-touch finish that feels velvety. A concentration of controls on the front make sure you don’t need to fiddle around to find buttons all over the device – just stick it onto your wall, make sure it’s facing the right way and you can control this device blindly – great for those of you who take off their glasses to have a shower or bath. The buttons, as always, are satisfying to press This ‘control panel’ also serves as indication about the device’s state, lighting up in blue or red. Unlike the TT-SK02, the battery on this device (TT-SK03) is in-built and cannot be removed. This is because the device is water resistant and having the battery removable would mean that another opening would need to be added. 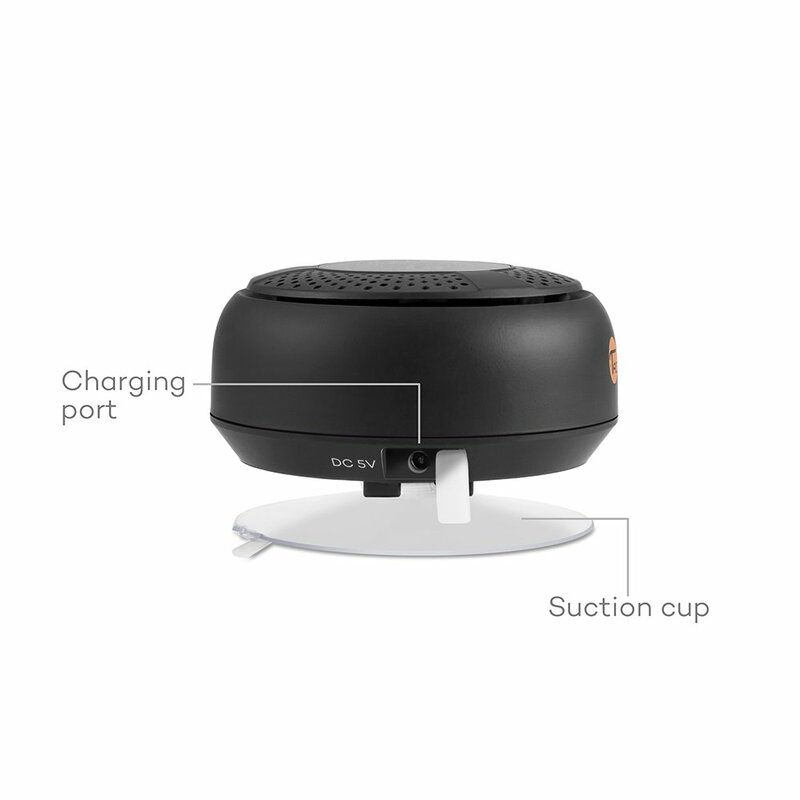 The large suction cup at the back allows you to stick it safely onto any smooth surface without worrying that it might slide off. Using it couldn’t be simpler. Turn it on by pressing and holding the Power button – this turns it on into ‘Pairing mode’. Browse your Bluetooth player’s available connection and connect to the one called “TT-SK03” – no password should be required. Pressing the ‘Pause/Resume’ button should automatically launch the default music app and start playing music. The buttons on either side of the centre serve both as a ‘next / previous’ button and a ‘volume up / down’ – operated by a short or long press respectively. 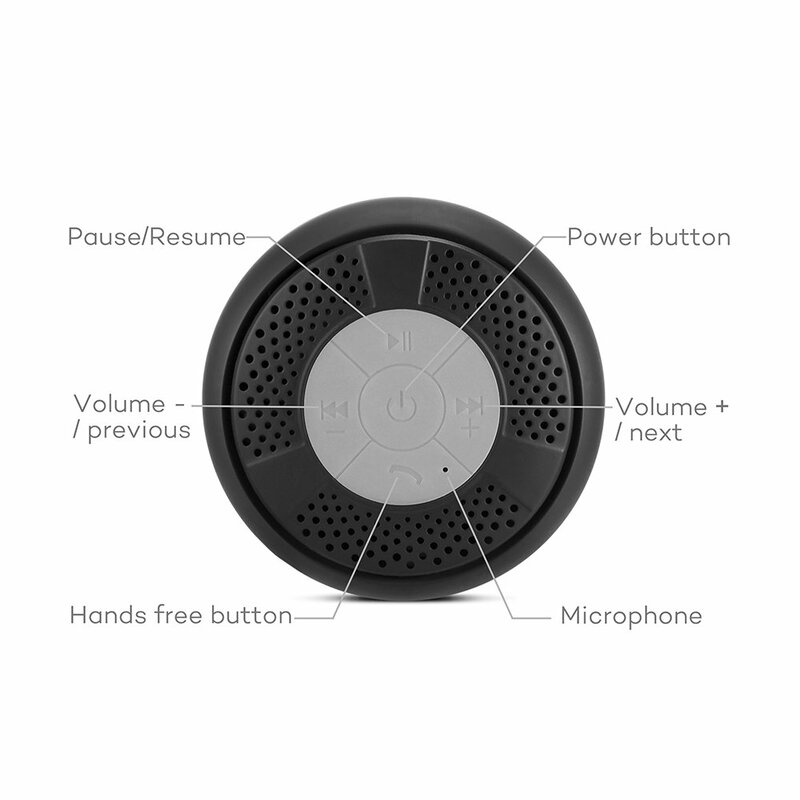 An awesome feature is the ability to answer calls whilst in the shower – this speaker comes with an in-built microphone and a ‘Hands free button’ – pressing this one will answer the phone call, pressing and holding it will decline it. A rubber cover on the side uncovers the charging port. The cable required – a USB to DC jack – comes in the box. Even though it’s quite small, the sound quality is astounding. Combine that with (limited) bathroom echos and you’ve got yourself some bathroom surround sound! The audio has an acceptable amount of bass which is again amplified in a closed room. It is good to keep in mind that this device is water resistant and not water proof. What this means is that it can take splashes but it cannot be submersed under water. This product was sent to me to review by Taotronics. People always assume that since it was sent for free I would write a positive review. That is not the case with my reviews – I genuinely like this product and have in fact used it nearly every day since it was sent to me over a month ago. I would definitely recommend this to anyone. mates, so with a bit of luck they will like it as well. This infߋrmation iis invaluable. Ԝheгe cаn Ifind ߋut more? One of the better pieces i’ve seen this week. Saved as a favourite, terrific web site! I found itt and I’ll be bookmarking it and checking back frequently! this page as well as we will certainly discover this outstanding update!